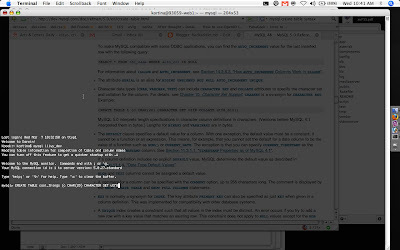 Often times I find myself looking up terminal tricks or mysql commands on the web, and rather than jumping back and forth between Firefox and Terminal, I have set my Terminal to be translucent so I can work in the terminal and view my reference material at the same time (I guess this problem is moot if you have a dual screen display, but until then...). The translucent terminal is especially nice if you like to use Terminal full screen, like I do. Another useful Terminal viewing option is Visor, which I found on Mac OS X Hints here. I'll put a post about how I've customized visor sometime soon, cause it takes a little tweaking to get Visor working nicely.